This week, a new biogas facility opened in San Antonio, Texas, and began turning greenhouse gases into a power source. Companies that partnered to develop and run the new facility are the San Antonio Water System (SAWS) which treats sewage and provides potable water and wastewater to about 1.3 million people in Texas, and Ameresco, a publicly traded energy services company. The project captures methane gas that’s generated during sewage treatment, and directs this gas into a commercial, natural gas pipeline nearby so it can be sold, delivered and used as energy for heat and electricity generation. 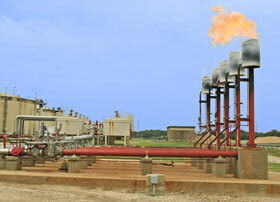 Typically, waste water facilities burn methane off in flares. According to U.S. Environmental Protection Agency research methane is about 21 times more powerful at warming the atmosphere than carbon dioxide, and has a chemical lifetime in the atmosphere of approximately 12 years. Methane’s relatively short life, coupled with its problematic potency as a greenhouse gas, makes it a candidate for mitigating global warming within 25 years, the EPA suggests. Ameresco will treat and transfer at least 900,000 cubic feet of methane gas from SAWS wastewater plant to a nearby commercial gas pipeline, where they will sell it on the open market. The gas will be used and sold as energy, and some royalties on the sale of the biogas will be returned to the water company and its customers, reducing its cost of operations, overall. SAWS expects to generate at least $200,000 a year from biogas sales. Biogas has remained somewhat scarce in the U.S. consumer energy market. Once biogas has been captured, it remains a challenge to transport it for use in fuel cells like the ClearEdge5 or the Bloom Box or other systems. BioEnergy Solutions in Bakersfield, California has taken greenhouse gases from dairy manure, and directed it into Pacific Gas & Electric’s pipeline, and Cargill has embarked on a number of biogas projects worldwide, mostly involving agriculture industry projects, but Ameresco and SAWS claim theirs is the first biogas project of its kind in the country. Environmentalists are eager to see more collaboration between large, public wastewater utilities and private sector or other companies that can help them curb methane emissions, while generating renewable, and low emissions energy.